The Greeks used silver vessels to keep water and other liquids fresh. The writings of Herodotus, the Greek philosopher and historian, date the use of silver to before the birth of Christ. The Roman Empire stored wine in silver urns to prevent spoilage. Before the advent of modern germicides and antibiotics, it was known that disease-causing pathogens could not survive in the presence of silver. Consequently, silver was used in dishware, drinking vessels and eating utensils. Pioneers trekking across the American West found that if they placed silver or copper coins in their casks of drinking water, it kept the water safe from bacteria, algae, etc. Prior to the introduction of antibiotics, Colloidal Silver was used widely in hospitals and has been known as a bactericide for at least 1200 years. In Ayurvedic medicine, silver is used in small amounts as a tonic, elixir or rejuvenative agent for patients debilitated by age or disease. Not until the late 1800's did western scientists re-discover what had been known for thousands of years - that silver is a powerful germ fighter. Medicinal silver compounds were then developed and silver became commonly used as a medicine. By the early part of the 1900s, the use of silver was becoming widespread. By 1940 there were approximately four dozen different silver compounds on the market. Although there were a few flare-ups of negative publicity regarding medicinal silver in the early 1900s, (due to the overuse of certain types of protein-bound silver compounds causing a discoloration of the skin called argyria and due to a supply of improperly prepared and unstable silver) reputable medical journal reports demonstrated that a properly prepared colloidal dispersion of silver was completely suitable with no adverse side effects. T. H. Anderson Wells reported in the Lancet (February 16th, 1918) that a preparation of colloidal silver was "used intravenously. . . without any irritation of the kidneys and with no pigmentation of the skin. " New knowledge of body chemistry gave rise to the enormous array of applications for colloidal disinfectants and medicines and for on-going research into the capabilities and possibilities for silver colloids. However, Silver’s “new-found” fame as a superior infection-fighting agent was short lived. During the 1930s, synthetically manufactured drugs began to make their appearance and the profits, together with the simplicities of manufacturing this new source of treatment, became a powerful force in the marketplace. There was much excitement over the new 'wonder drugs' and at that time, no antibiotic-resistant strains of disease organisms had surfaced. Silver quickly lost its status to modern antibiotics. Electrical ionization units that impregnate the water with silver and copper ions are used to sanitize pool water without the harsh effects of chlorine. The former Soviet Union used silver to sterilize recycled water on their space vehicles. Some U.S. municipalities use silver in treatment of sewage. In the Japanese work place, silver is a popular agent in the fight against airborne toxins as well other industrial poisons. Silver-infused bandages and wound dressings are now commercially available. Silver has been found to prevent the infection resulting from burns. But for the most part, with the discovery of pharmaceutical antibiotics, interest in silver as an anti-microbial agent declined almost to the point of extinction. The return of silver to conventional medicine began in the 1970s. The late Dr. Carl Moyer, chairman of Washington University's Department of Surgery, received a grant to develop better methods of treatment for burn victims. Dr. Margraf, as the chief biochemist, worked with Dr. Moyer and other surgeons to find an antiseptic strong enough, yet safe to use over large areas of the body. Dr. Margraf investigated 22 antiseptic compounds and found drawbacks in all of them. Reviewing earlier medical literature, Dr. Margraf found continual references to the use of silver. However, since concentrated silver nitrate is both corrosive and painful, he diluted the silver to a .5 percent solution and found that it killed invasive burn bacteria and permitted wounds to heal. Importantly, resistant strains did not appear. But, silver nitrate was far from ideal. So research continued for more suitable silver preparations. Silver sulphadiazine (Silvadene, Marion Laboratories) is now used in 70 percent of burn centers in America. Discovered by Dr. Charles Fox of Columbia University, sulphadiazine has also been successful in treating cholera, malaria and syphilis. It also stops the herpes virus, which is responsible for cold sores, shingles and worse. The history and uses of colloidal silver are well known and documented. They can be researched easily on the Internet through search engines and any colloid forum, bulletin boards or blogs. We cannot link to them or publish them here because Federal Law prohibits any claims or testimonials associating our products or product ingredients with any disease states. 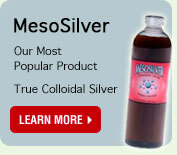 Keep in mind that the particle surface area of our colloidal silver product, MesoSilver, is the highest ever tested. This means it is the most effective of any colloidal silver product ever made. With not a single serious adverse event ever reported, it is also one of the safest supplements on the market today.